Tour Confidential, Tiger Edition: What are your expectations for his return and for his season? GOLF.com convened an emergency roundtable with writers from Sports Illustrated and GOLF Magazine to discuss Tiger Woods's return to competition. Check in every Sunday night for our regularly scheduled Tour Confidential to get the unfiltered opinions of our writers and editors, and join the conversation by tweeting us @golf_com. 1. Tiger Woods announced Monday that he will make his much-anticipated return to competition at his own event, the Hero World Challenge, in November. Hank Haney won't have been surprised by this news -- he told us last week that Woods would play -- but what was your reaction? Josh Sens, contributing writer, GOLF Magazine (@JoshSens): My first reaction to the news was, uh-oh, someone's probably going to ask what my reaction to this news is. My second reaction was, I'm not surprised, what with all the swing video teases he's been releasing. He was going to come back sometime, and what better event than this most friendly affair? Sean Zak, associate editor, GOLF.com (@Sean_Zak): I had just sat down in my local barbershop. All I did was smile and giggle, knowing that no matter how this plays out, we'll have some fun golf to watch in early December. Can never count on that. John Wood, caddie for Matt Kuchar (@johnwould): Excitement. I wasn't surprised by the announcement, seeing as he was making full swings with a driver weeks ago. I think it's the perfect spot for him to return to competition -- not the full chaos a full tournament would bring and really surrounded by people who enjoy being around him and want him to come back. I think it would be wonderful for this amazing crop of twenty-somethings that Tiger inspired to play this game in the first place to experience a Sunday at a major with Tiger in the lead. Just once. It's just bigger. Dylan Dethier, associate editor, GOLF.com (@Dylan_Dethier): Surprised? Nah. But after months and months of managing expectations and having rational discussions that the Tiger we knew may be gone forever, we've been drawn in big time. We've got Zak giggling in barbershops, fer goodness' sake. Michael Bamberger, senior writer, Sports Illustrated: I didn't think Woods would play any tournament golf until about March. Everything I think or predict about Tiger Woods is wrong. I've been saying for a while that I think he'll win a Tour event again, and maybe a Masters. Consider the source. Alan Shipnuck, senior writer, Sports Illustrated (@AlanShipnuck): It feels like he's rushing this a bit -- wasn't it only a couple of months ago he was restricted to chipping only?! -- but I guess if you're Tiger you've got nothing else to really do, so why not go for it? But I'm certainly having deja vu, as I was in Albany last year for Tiger's much-anticipated return. We all know how that turned out. Jeff Ritter, digital development editor, GOLF.com (@Jeff_Ritter): I'm pumped to see him back in action, but it's worth mentioning that in less than a month Woods went from hinting that he may never play again to entering the Hero. Hopefully this comeback has a happier ending than the last one. 2. After a 15-month hiatus in 2016, Woods also made his return to tournament play at the Hero, where he led the field in birdies but still finished 15th in the 18-player field. What would you deem to be a successful performance for Woods this time around? Sens: Obviously, getting through the week without a wince and a back-grab would be good. But more than that, no chip yips and no prolonged stretches of two-way misses. Zak: Finishing top 17 (pending any WD) would be a great success, meaning he would beat at least one other golfer. That'll be high expectations for the health-focused crowd, but he wouldn't be playing, mashing stingers or bombing d-stick if he didn't already feel great. Beating another pro over four rounds would be an all-inclusive sign of his game being in solid shape. Wood: Flashes, signs and streaks. No one could be expected to be tournament sharp after that long layoff. If he can play honestly pain free and make a bunch of birdies like he did last time here, then whatever isn't sharp should improve with play and practice, assuming he feels healthy. Bamberger: Along those same lines, if he can focus for 72 holes on each of his shots, that would be an accomplishment. That was his stock in trade all through his prime. Along with others, I am nervous for his chipping game. Dethier: Four full rounds without shooting 80 feels like a good place to start, and anything else is a bonus. I saw one betting site where you can bet $100 dollars to win $1 on Tiger NOT winning the Hero. Not a great return, but still… sounds like free money. Shipnuck: I'd like to see him smiling and having fun, playing to the crowd and the TV audience, and not grinding, grimly. I certainly hope he won't say in his press conference that winning is the only way the week can be successful. That Tiger is long gone. Ritter: No pain, no yips. I also wouldn't mind at least one fist-pump. The exact same result as last year, 15th place with a bushel of birdies, would be a great first step. 3. Which part of his game will you be watching most closely? Sens: For signs of physical health, I'm curious to see how smooth he is with his driver. For an indication of his mental game, the whole world will be watching his chips and pitches. Zak: I feel his putting will be fine and average. The chipping will be on many folks' minds but I want to see if he can hit 10 fairways in a round, if he can move from driver to 3-wood to stinger if he likes a different shot-shape off the tee. Again, probably asking for too much, but things like that would resemble serious, non-exhibition form. Wood: His routine. If he looks comfortable, and his mind seems quiet as he plays, and he gets into a routine and looks like he's just playing golf rather than working on his swing. I have nothing to base this on, but I have a feeling this time around Tiger isn't going to get bogged down with mechanics, that he's saying to himself, "I am still Tiger Woods, and I'm going to play golf like Tiger Woods, not how anyone else wants me to. I'm going to win or lose with my game, and my thoughts and feelings." All due respect to Butch Harmon, Sean Foley, Hank Haney, Chris Como, it was Tiger all along. Dethier: I just want him making full swings through the ball. Tiger has looked tentative at times, like he's afraid to release the club through impact (I can relate). I don't mind seeing misses, as long as they're hit with conviction! Bamberger: Exactly. Speed through the ball, with every club, including the putter. Ritter: Near the end of his last event in Abu Dhabi, I remember watching Woods stick his wedge in the ground and use his club to help boost himself out of a bunker. He was clearly in pain and doing his best to hide it. I hope to see nothing resembling that ever again. 4. In 2016, Woods shot four under par over four rounds, finishing 14 shots behind Hideki Matsuyama. Prediction time! What will he shoot this year? Sens: Four under par, 39 strokes behind Justin Thomas. Zak: Damn, JT taking things deep in Sens' world! Seven under, 14 strokes behind a coming-for-blood version of Jordan Spieth. Wood: Seven under, T10, and then he gets pissed off when people tell him, "Good playing" like old TW would. Shipnuck: Whatever J. Wood is smoking, I want some! Two under, DFL. Dethier: Even par. I'm still trying to manage my expectations! By tournament week I will have talked myself into him winning. Bamberger: I don't know what he'll shoot. If he beats four or five guys, that's a lot, given where he's been. Ritter: I think he'll beat one other guy. And that's fine for his first event back. 5. Does this announcement change how you feel about Woods's prospects for 2018? Sens: Not really. I expected him to come back at some point in 2018. 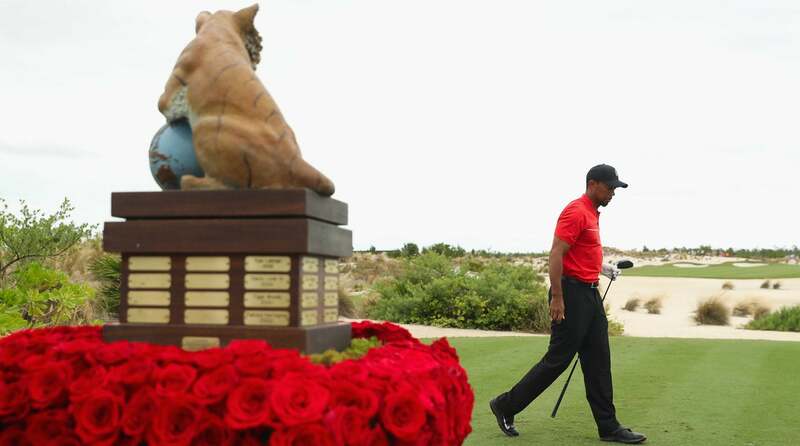 More telling will be how he plays in the event, and what comes after -- whether the week winds up feeling like a step forward toward returning to the big events that we've always used to measure Tiger, and which Tiger has always used as a measure of himself. Zak: Considering this feels like "Take 2" of last year, and he had that rigorous schedule laid out for early 2017, I now expect a full "Tiger Schedule," so Torrey, Riv, Pebble, API, Masters, Players, National, etc. His "prospects" for a consistent driver remain wildly unknown, though. Wood: Agree with Zak, but no Pebble. Dethier: It makes it feel real, and that makes me excited -- but also a little nervous. Like, if something should go wrong, it's hard to imagine ANOTHER comeback. Yikes. Ritter: I thought he might play once before the Masters. I suppose if he comes through a series of early events healthy and shows progress along the way, that might mean that he could...maybe...possibly…contend at the Masters? Bamberger: A guess is that he's not drinking, trying to deal with other unhealthy habits, trying to keep his kids close, keep up Elin's faith in him as a father, trying to develop into an elder statesman of the game who is loaded with gravitas come Ryder Cup time, trying to develop corporate relationships rooted in his personality and not his playing accomplishments, coupled with travel for sporting activity, design-work, his social life. Much of his greatness was rooted in his spectacular sessions on the range with teaching pros who knew a great deal. The patience that takes is staggering. He'll have low rounds. You can't kill that much golfing greatness. But four good rounds in succession? I'm doubtful he has it in him. But to repeat myself, almost everything I predict about Tiger Woods is wrong. Shipnuck: Dang, you guys are going all-in after seeing a total of three or four swings on Twitter. Tiger has a looooong road ahead of him, a very tall mountain to climb and various other cliches to surmount. Over the last three years his body has repeatedly broken down. I would *love* to see a healthy, rejuvenated Woods play a heavy schedule, recapture his magic and become a consistent contender. But that'll take months of competition with no serious setbacks to his shattered body or fragile psyche. I don't share the collective confidence on here about where this is heading.